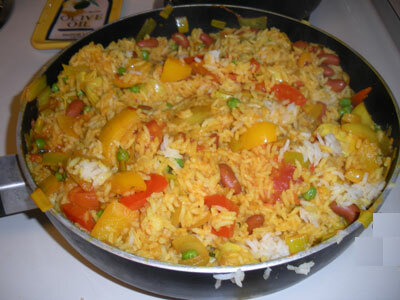 Paella is a rice dish native to Valencia, Spain. They fix it there in huge skillets over open fires in the same spirit as the American cookout. The version below is easier to make than the one they make in Spain, and it's full of veggies. 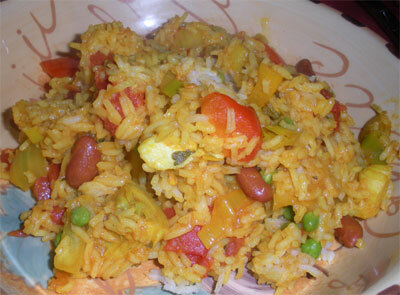 1) Cook rice according to package directions, but use vegetable broth instead of water for cooking. 2) Heat olive oil in large, deep skillet over medium heat. Add chopped onion and leek and sauté about 5 minutes. Add red pepper and spices. Then add garlic. Saute a few minutes. 3) Add the can of tomatoes, the pinto beans, the artichoke hearts and the peas and simmer about 10 minutes. 4) Add the rice to the mixture and combine. Let everything cook together another 5 or 10 minutes. Makes a huge pot of paella.